The Queen of the Tearling did not turn out quite how I expected it to. The premise seems almost fairytale: Kelsea Glynn has been raised in isolation by her guardians, educated but with vital gaps in her knowledge. She’s always known that she is to queen of the Tearling realm, but is woefully unprepared for the realities when soldiers fetch her so she can take her inheritance. The Tearling kingdom is far from ideal. Her uncle, who’s been ruling in her stead until now, is corrupt, as are many of the officials. 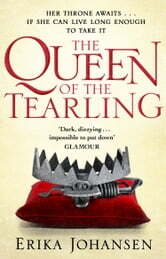 An annual tithe to the neighbouring kingdom of Demesne and its Red Queen means that hundreds of Tearlings are essentially sold into slavery to keep the Red Queen at bay. When Kelsea’s first act as queen puts a stop to this barbaric practice, she sets in motion consequences that will see her overturning years of custom. Supported her cabal of loyal guards, Kelsea has pretty much only a week to find her feet in a hostile environment. Even once I was done with The Queen of Tearling, I couldn’t quite figure out whether this was straight-up fantasy, or SF bleeding fantasy at its edges, which resulted in a pleasant ambiguity. There is mention of ships in a perilous crossing, but whether this was an actual ocean in a post-apocalyptic setting or reference to a distant past where space travel took place – we don’t know. Certainly, there are some magical elements that hint towards fantasy, but what we do know is that the setting is very much post-technological, similar to Mark Lawrence’s The Broken Empire. Much like Lawrence, Erika Johansen also does not shy away from darker, grittier occurrences, and Kelsea Glynn’s honesty and earnest need to do the right thing, no matter how challenging, makes for a fascinating journey as she overcomes ever-increasing odds that pile up against her survival. 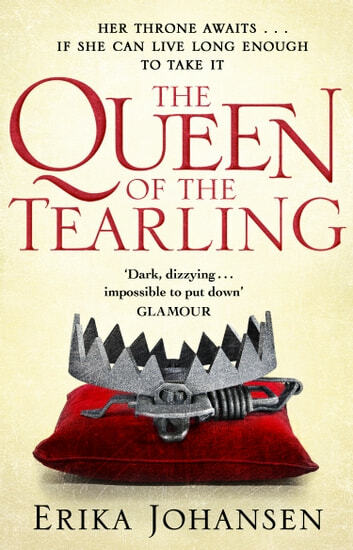 This is not an easy read, and for those in need of a breakneck pace, The Queen of Tearling might not be for you. What we do have, is a slowly unfurling saga of epic proportions, as a young queen grows into her powers. Kelsea often has to often make difficult decisions that bear surprising results, and I’m watching her career with great interest. Loved it! The rich, detailed writing drew me into Kelsea's world and kept me involved until the end. I felt for Kelsea, who had previously led an isolated, sheltered life and was suddenly thrust among strangers with only her limited experience and her magic sapphire to guide her. I loved that she was not beautiful and perfect in everyway. I fell in love with the other characters too and have already jumped into the next book in the series. Enjoyed it immensely. Kept you guessing. Lots of unanswered questions...cant wait for the next one! I had heard good things about this book but i was surprised how much i really really enjoyed it. I was captured from the start till the end. The characters are very interesting as are their stories. Its not your normal happy fiarytale either which is great. I have read the 2nd book and can not wait for the 3rd! A great story teller dealing with the perennial issues of justice, human frailty and corruption. The heroine is a strong and plausible character even without the benefit of her magic jewelry.